Full Details & Specs. of the Zanzibar Pool are located beneath the pricing chart below. SUPER STRONG STEEL CONSTRUCTION – Steel is the strongest material used in above-ground pool construction. The Zanzibar uses thick gauge steel in its uprights and sidewalls to make this pool rugged & durable. The attractive 8” resin top rail is beautiful, but also softer to sit upon and will not dent like steel top rails. These pool features are produced with expert craftsmanship resulting in a pool that is not only strong, but has an excellent fit & finish. 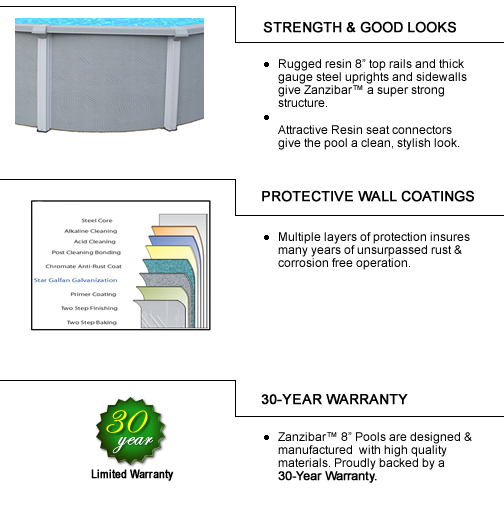 CORROSION-PROOF PROTECTON – The Zanzibar uses advanced coating techniques that insure that this pool will not rust or corrode during normal use. The 8” top rail not only adds beauty- it will never rust, corrode or dent. It is impervious to water or chemical damage and it is loaded with UV inhibitors to protect it from sunlight. EASY INSTALLATION - Zanzibar pools are designed to assemble quickly and easily by do-it-yourselfers. Installation instructions are included with each pool. Invest in our heavy duty Zanzibar pool this spring and get in on the family fun. Our pools come standard with a widemouth skimmer and return fitting. They are backed by a 30-Year Limited Warranty. Available with a 54" wall in a variety of round and oval sizes to fit your backyard.